Controlling traffic noise has become an increasingly important priority in recent decades. The European Union addressed the general issue of environmental noise in a 2002 European Directive known as the “Environmental Noise Directive (END)”. Traffic noise forms a major part of the problem and can be abated by the construction of noise barriers and/or low-noise surfaces, the latter being the most efficient solution. 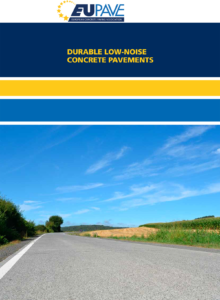 In this brochure EUPAVE shows concrete pavements are not as noisy they are often perceived; provide examples of techniques to ensure low-noise concrete pavements and look at case studies and real data showing concrete’s performance. In order to make the right choice of pavement, a global evaluation is needed taking into account the safety, durability, the life cycle cost and the surface characteristics.